Air Tanzania's Boeing 787-8 Dreamliner at the Julius Nyerere International Airport (file photo). 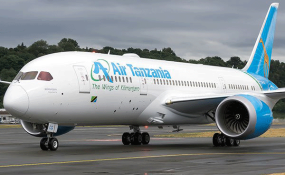 Dar es Salaam — Air Tanzania's new Boeing 787-8 Dreamliner will start flying to Guangzhou in China via Bangkok, Thailand in February next year. Guangzhou is the third largest city in China, after Beijing and Shanghai and one of the world's oldest and busiest trade hubs.